What do you like/suggest? I'll need to get some show clothing but not sure what the best deal is - don't want to get stuff I can only wear in conformation! If I end up showing Aeri in confo I'll prob end up getting dress pants with pockets and pair them with various nice shirts - no swirly skirts with a very easily wound up malinois, here! I'd like to see others responses. I have yet to find an outfit I truly like for showing in. most stuff doesn't fit my body type very well. Right now I either wear jeans if it's a barn show or dress pants if it's a non barn show, and one of three dress tops. I would certainly like a nice pants suit set with a nice blazer if I could ever find a blazer that fit me. I have khakis and a pair of grey pants I pair with some knit tops for conformation, but I don't like them very much. I can't wear black because Logan is black, so my choices are a bit limited. I need to find a new outfit, too. If you go for skirts, you need it skirt suitish length, pencil like.. I had issues wanting to look nice but still move. I got judge feedback that my skirts were out doing my dog. Needed shorter or more understated. Though I tried to go for plain, Anything swishy at all I was told was too much in a nice non snarky way. Scary to wear off-white pants, but they set off my dogs pretty well. Due to my short, heavy build, it's hard for me to buy pants that actually fit. The legs tend to be too long, so I buy capris or other shorter type pants. Anyway, these are awesome because they have a little bit of spandex in the blend, so they still look and feel like natural fiber, but they have some give. So I can run straight from the breed ring, to performance in them, as I did here. Unfortunately, a dog chewed out one of the pockets, and now one of the seams is popped. I might see if I can mend it (I'm no seamstress), because they really are the best pants I've had. 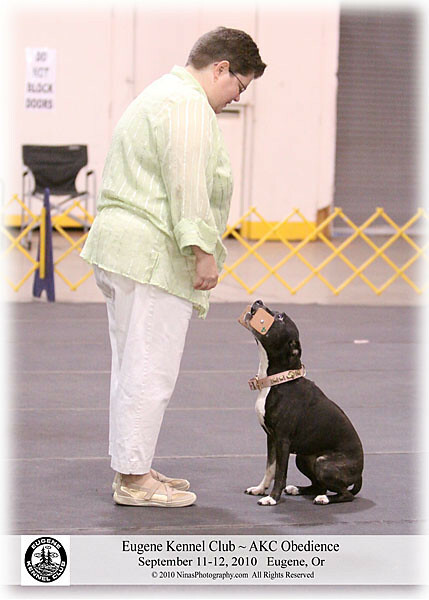 When I was showing at Eukanuba a few years ago, I did buy a skirt suit to wear. I found the perfect one, also at Ross, in tan shades. I wore it a few other times at indoor shows, just because I had it, but it was a bit big for me, and I ripped a seam in the skirt kneeling on it, so I'm done with it. I prefer to wear pants, anyway. For UKC, either black or khaki pants with a nice top. I'm lucky with Sako, I can wear just about anything (except white pants) and it works. One day I hope to be able to afford a nice pants suit (or at least a suit jacket), but I don't show all that much, so it's not huge on my priority list. I've also gotten in to the habit of just putting bait in my armband, but if I do get a suit jacket, I would love one with good pockets to put bait in there instead. Still sometimes I feel like having casual Friday, Saturday or Sunday at a show. On those days, l'll wear khakis and a nice colorful top. And if it's really hot, sometimes just a skirt and nice tank top. If it's really wet or muddy, I go with a skirt cause suit pants in light colors don't hold up so well to mud. I actually won a BOS once while wearing shorts and a tank top. I wouldn't really recommend that. It was a hot outdoor show, I was doing agility, entered my girl in conformation only because I thought she'd be in season, and wanted a reason to bring her along. I couldn't be bothered to dress up, so I just bought brand new, solid colored casual clothes. I was a little surprised to win. And I love this place, they have great stuff and great deals! I usually wear the business skirt suit type of clothing. Knee length or slightly shorter pencil skirts and a jacket with pockets. I have to go with skirts because of my height. I have tried the pants suits and I just don't feel comfortable in them. That and wearing a skirt makes it super easy to change your clothes in the back of your van after you are done in the ring. I have various dress pants/capris/blazers from talbot's (expensive but they LAST!!!) and a skirt & a dress that will go with said blazers from TJ Maxx. A little off topic, but I have to say, Kady, you are rocking that suit! I competed in speech in high school, and we had to wear suits for competition, and I still appreciate a well-fitted and classy suit! I have the hardest time finding suits that fit my body style, I always end up having them tailored. I'm thankful I'm not showing in Conformation right now lol.